There are three phases to implementing an Equipment Reliability Improvement Program: planning, technical work and the living program. 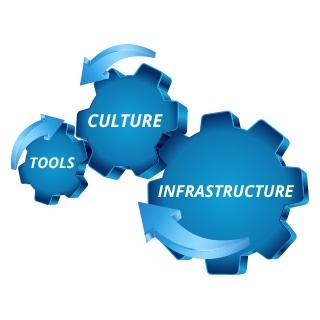 During the planning phase we address the three overlapping areas of (1) Culture, (2) Tools, and (3) Infrastructure. Engineers and technicians are familiar working with tangible entities such as procedures and equipment, and are generally comfortable implementing new processes. However, because an Equipment Reliability Improvement Program often crosses departmental lines, changing many of the interfaced groups’ business processes, there is a tendency for groups to resist these changes unless they understand how it will benefit them. It takes good communication and effective education of the benefits that they may realize, to get the full cooperation of the interfaced groups, which ensures program success. Fractal Solutions shows you how to address the three areas; maintaining continuity between the tangible and intangible elements as depicted in the gear diagram. The Planning phase includes setting program goals, selecting the evaluation method, building the infrastructure, installing our RCM Optimization software, PREMO XPERTS®, knowledge transfer, and conducting the pilot evaluation. The essential element in setting program goals is to identify the purpose of the Reliability Improvement Program activities with respect to the overall objectives of the PM program. It is important that program goals are stated so that technical activities can be viewed against these overall objectives. Once the Planning phase is completed, the technical work will start. Fractal Solutions offers consulting services to ensure the management of the program is progressing effectively. A live program needs to offer continuous improvement opportunities. We also provide workshops to different stakeholder groups, including a comprehensive train-the-trainer workshop for Reliability Improvement team facilitators. Learn more about training seminars and workshops.